Something I always wondered when I began practice was how radiologists come up with recommended intervals for repeat imaging. Whether this is for a lung nodule, pleural effusion, or thyroid nodule. Lo and behold there are guidelines for when to repeat these diagnostic tests. Today we will be discussing the diagnostic evaluation and treatment of thyroid nodules. Thyroid nodules are common throughout the population, especially in those who are females. However, there are a number of these nodules in the thyroid gland that go missed due to being nonpalpable on examination. These nonpalpable nodules are often found as incidentalomas on imaging for other reasons. For these surprise nonpalpable nodules, the same workup should be instituted as the workup for a palpable thyroid nodule felt on examination. The number one goal when evaluating a thyroid nodule is to determine if it is malignant or not. The first step is to complete a thyroid stimulation hormone (TSH) test and a thyroid ultrasound. If the patient has a past medical history of head or neck irradiation, thyroid cancer, or MEN type 2 in a first-degree family member, then biopsies should be taken.1Hyperfunctioning (hot) nodules do not need to be biopsied. If a nodule is found to be nondiagnostic or indeterminate on FNA, a repeat fine needle aspiration needs to be completed in one to four weeks. If FNA finds benign results, follow up testing should be completed in six months.If malignant or suspicious for malignancy, then thyroid surgery should be completed. For hyperfunctioning nodules, radioactive iodine 131 ablation is the first line treatment. Since there is little activity in the surrounding thyroid tissue due to axis suppression, there is minimal uptake of the iodine isotope in the tissue surrounding the nodules; therefore, minimal damage is done to the remaining thyroid gland. In cases where pathology of FNA is malignant, surgery to remove the affected thyroid lobe or lobes is recommended.1 Diagnostic lobectomy is recommended for nodules 4 cm or larger due to this size being an independent predictor of malignancy. Also, FNA in a nodule this size may miss a malignant area and be falsely read as benign. If a solid nodule is benign on repeat FNA, they can be followed with ultrasonography or removed surgically if symptomatic. Studies have shown that the rate of thyroid nodules is higher in patients who are pregnant. The workup for these patients should be the same as the general population including ultrasonography and TSH measurement. In cases of euthyroid or hypothyroid pregnant patients with a nodule, FNA should be completed when indicated.In cases in which the TSH is suppressed, workup should be delayed until after pregnancy and lactation, and then at that point, thyroid scintigraphy can be completed. If a pregnant patient is symptomatic due to a hyperfunctioning nodule, they should be treated with antithyroid medication, the same as a pregnant patient with hyperthyroidism with Graves disease. 1.Am Fam Physician. Thyroid Nodules. 2013;88(3):193-196. 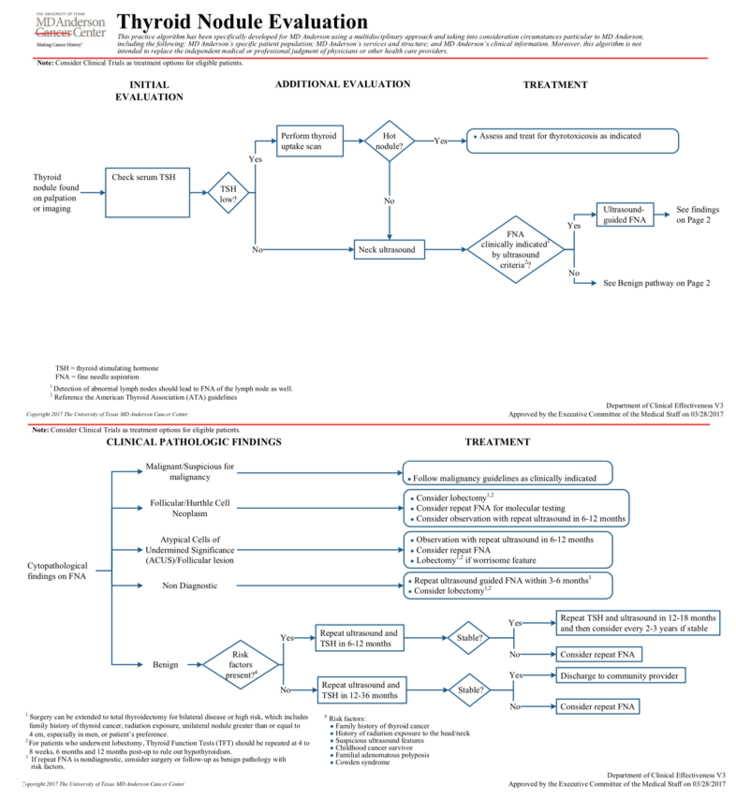 Copyright © 2013 American Academy of Family Physicians. 2.UpToDate. 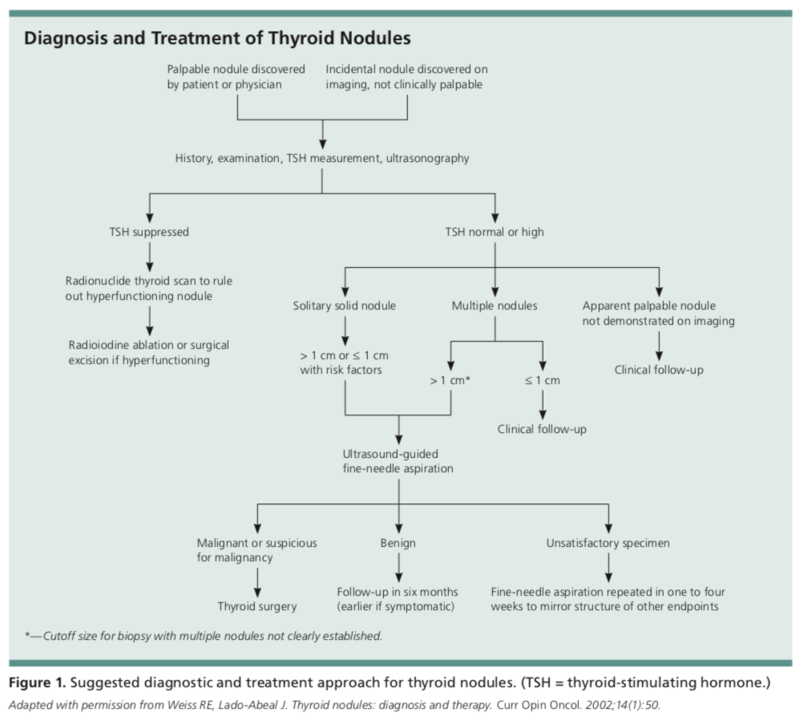 Diagnostic Approach to and Treatment of Thyroid Nodules. Accessed: March 10, 2018. 3.MD Anderson Cancer Center. Thyroid Nodule Evaluation. Accessed: March 10, 2018. 4.Ferri's Clinical Advisor. Thyroid Nodule. 2017.